The Spark is Chevrolet's smallest and least expensive vehicle, aimed to compete with minicars such as the Scion iQ and Fiat 500. A fuel-efficient engine enables the Spark to achieve up to 39 mpg, while an all-electric version is rated to travel up to 82 miles per charge. It can get jittery on the highway, but is at home in the city. My spark is a cute and reliable car that could be great for first time drivers! I love my spark! My vehicle is reliable. I have had a handful of problems over the last 2 years of having the car. Everything has to be specially order as well because my car is so small (for example, the battery). I also find that when I run the a/c, my car has trouble going. However, I feel like these are just normal maintenance issues that could be avoided with proper care, like routine oil changes and keeping the fluids full. Other than that, I love the style of my car and it is very comfortable. I especially love how sleek and modern the dashboard looks! The speakers and AUX cord is extremely helpful for long trips and super convenient for playing your own tunes, which is something I always appreciate in a car. Also being a commuter myself, you cannot beat the gas mileage I get! The car drives very well and though it is tiny, it packs a good punch. You would think that because it is so small it would be crowded on the inside, however, it is actually pretty roomy. I am tall myself and I have no issues fitting in it comfortably. The seats in the back go down as well, which makes moving things easy and makes for a lot more room than you would think. I think my car is great for young adults because it is easy to maintain, is great on gas mileage, could be use for daily or commuter use, and most importantly, extremely attractive. The gas mileage is amazing. 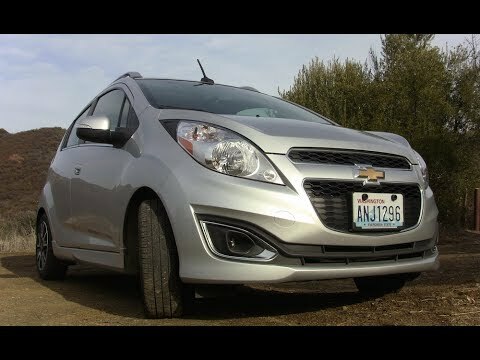 The Chevy spark is great. It does not really have any 'get up and go' but it is fun to drive. Mine is a manual transmission. The car like small but is incredibly roomy on the inside. I have the very basic spark. So I do not have the touch screen rap or the option for Bluetooth. It does come with OnStar but I do not have a subscription. The Chevy spark gets phenomenal gas mileage. I filled up the tank with $22 the days ago and it is still got over 3/4 of a tank of gas. I am a vertically challenged person so this really is a great car. It is big and small at the same time. My husband has no problem with space while driving or riding. Reliable car with decent gas mileage. I bought my car new in 2015 (it is a 2014) and have not had any problems with it thus far. It doesn't have the pep off acceleration but it gets going well enough. It is not the most comfortable car to sit in but I like that it seems to set higher off the ground than most cars making it easier to get in and out of. I drive several miles with my job in homecare and it has been very reliable and good on gas getting at least 34 mpg with city and highway mixed. I don't like that my options are limited but it gets me from here to there without worry. No electric door locks or CD player or cruise control.